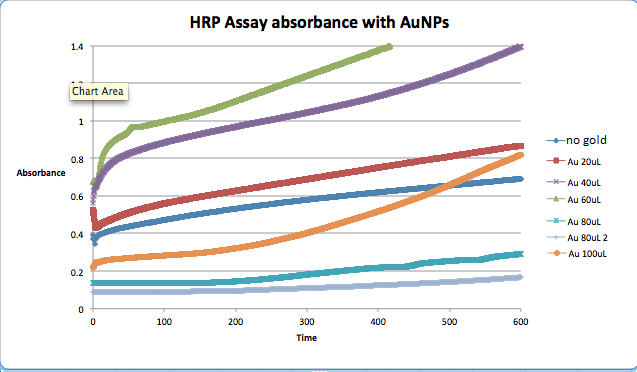 Obtain kinetic UV/Vis spectra for HRP assay at wavelength 510. Procedure, and most concentrations will be the same as HRP assays done by another group1 in |AU's Biomaterial Design Lab. Varying concentrations of gold nanoparticles will be added. The HRP concentration was increased from 1.5μM to 2.3μM because it did not produce a peak at first. The more nanoparticles added, the more stretched out the curve and the slower the reaction. Although the trend isn't perfect, the sets with 80μL and 100μL begin to slope up much later, and reach a much lower absorption over the 3 minute trial span. This page was last edited on 26 September 2017, at 22:06.